Being creative with your photos has never been easier. October 4, 2017 – The Elements team is excited to announce the release of Photoshop Elements 2018 & Premiere Elements 2018. Over the years, the Elements products have emphasized easy photo and video organization, editing, creation, and sharing by combining content intelligence with a user-friendly interface and modes for every level of user. This release focuses on enhancing the experience even further for memory keepers with hassle free organization, automated editing and some fun new Guided Edits that walk you through how to edit and create. As you’ll see, there are a number of exciting new features and enhancements so being creative with your photos and videos has never been easier. Auto-Curate – You no longer need to painfully look through a large batch of your photos to select the best ones. The Elements Organizer now automatically curates your photos based on quality, faces, subjects and more. Totally reimagined slideshows – Slideshows are a popular and fun way to showcase and share your memories, and now you can turn your curated photos and video clips into stylish and dynamic slideshows with just one click. And of course you can add your own personal touch by choosing a different theme and music, or adding captions. New Guided Edits – Guided Edits transform seemingly complex tasks into easy to follow step-by-step instructions that guide you to fantastic results. Photoshop Elements and Premiere Elements now offer 67 Guided Edits, including eight brand new ones in this release. Swap Backgrounds – Replace backgrounds in seconds by selecting the subject of a photo and placing it on a background that’s more interesting. Create Double Exposures – Double exposures continue to grow in popularity, but are difficult and time consuming. No more with this new Guided Edit that brings one photo to life within another to create the surreal effect. Add Artistic Overlay Effects – Embellish any photo with a shape overlay and one-click effects that make it a work of art. This Guided Edit is great for scrapbook pages and photo crafts. Make Amazing Watercolors – With this Guided Edit, turn any photo into a beautiful, textured watercolor—and even finish it off with text. Create fun bounce-back effects – Get step-by-step help making a segment of your video run forward and backward repetitively. Export your bounce-back effect as an animated GIF or short video clip that you can quickly share across social channels with your friends and family. Freeze frames with motion titles – Another new Guided Edit that helps you create a freeze frame of your video and add an eye-catching motion title for pro-looking results. Fix Action Cam Footage – Eliminate the wide angle fisheye effect of action cams with guidance on how to expertly trim, correct color, and fix lens distortions so it looks its best. Create animated social posts – Create a short visual story to share on social media by embellishing a video clip with either static or animated text. Automatic Selection – Making a perfect selection is always tough, so we’ve simplified the process. With the new Auto Selection, making precise photo selections has never been easier – simply click, drag and it’s done. Open closed eyes like magic – This happens all the time. You take several group photos and in every one someone has their eyes closed. Well we’ve got a fix for that. Photoshop Elements can now automatically copy the open eyes from one photo and blend them into another to create the perfect shot. Candid Moments – Now you can automatically extract great photos from your raw video footage with ease, and never need to worry about missing that critical photo while shooting your videos. Smart Trim – Automatically trim the bad scenes and keep the good ones based on the style of your video. Smart Trim finds and brings together the best scenes based on the style of your video, and you can even customize that automation. These are just some of the new and enhanced features in Photoshop Elements 2018 and Premiere Elements 2018. We hope you’re as excited about this release as we are and look forward to your feedback. 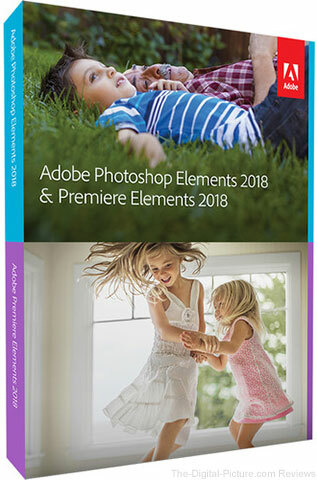 B&H has Adobe Photoshop Elements 2018 and Premiere Elements 2018 available for preorder.